A quick update from the patch. There have been up to five yellow wagtails on the Budge fields, none today, though evenings seem better. I did the WeBS count today, a drake garganey was a highlight along with a nice red black-tailed godwit. Whilst counting the ducks, a chap called Andy said that he thought he had a hooded crow flying west, he was right, it was! 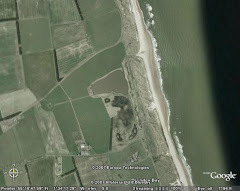 It seemed to come from the sea/dunes and was flying to the north of the Budge fields, headed west, We watched it as it disappeared from view towards Widdrington Village. My first patch hoodie since 2008 when one loitered from the 11th to 13th April. From the Oddie hide, a male marsh harrier flew south, mobbed by a sparrowhawk. In the bushes, singing sedge warbler and whitethroat are new in and there are lots more willow warblers singing. I hope you eliminated hybrid !